If you are planning a medieval wedding, handfasting, or blessing ceremony, The Grinnigogs are a perfect way to set the scene and create the right ambience. Music is a lovely way to enhance the atmosphere and emotion at your special event. The Grinnigogs specialise in performing medieval style music on Hammer Dulcimer, Hurdy Gurdy, bag-pipes and cittern. You’ve booked an impressive venue and for an added wow factor, you can have jesters, jugglers, stilt-walkers and minstrels to meet and greet your guests and ‘break the ice’. All the entertainers will set the scene in full period costume. A Highland piper is often employed to play for the arrival of the Bride. We can arrange this for you, or alternatively, The couple can be piped in to the ceremony with traditional medieval bagpipes. If you have special requests to be played during the ceremony we are more than happy to learn them. We have piped the couple in, provided fanfares and played gentle reflective music as a part of the service for private reflection and for the signing of the register. We can provide beautiful music played on the hammer dulcimer, uplifting celebratory music, or you could leave the ceremony to the sound of the rousing skirl of the highland pipes. Whatever your requests for this important day, we will do our best to accommodate it. If there is going to be a break before your wedding breakfast or banquet you could treat your guests to some medieval entertainment – jesters, jugglers, or perhaps a medieval puppet show for the children. 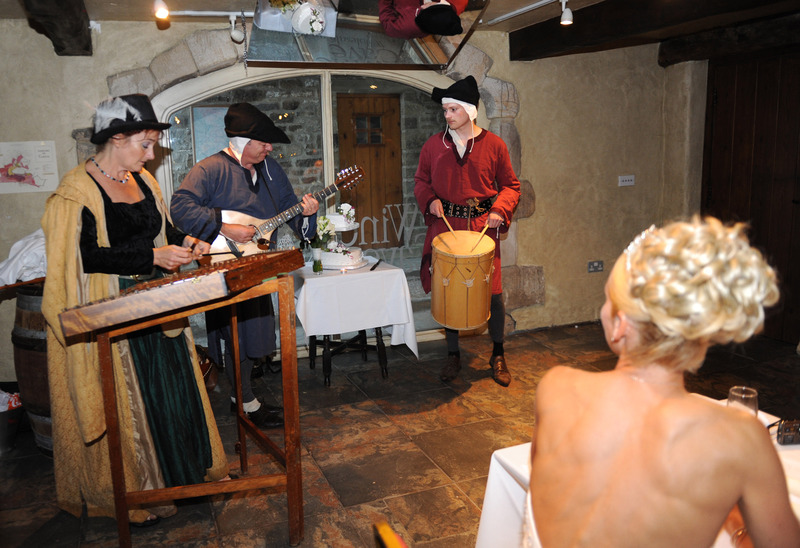 Medieval minstrels strolling amongst your guests, are a core ingredient for any banquet. Other options include: fortune tellers, storytellers, jesters to keep adults and children entertained, a medieval master of ceremonies to introduce the food, the speeches and amuse all with humourous asides and medieval games, challenges and ridddles. A medieval dance is a wonderful alternative or warm up for a disco. Our dance leader and musicians will guide you through a variety of period dances, including the notorious Horses Brawl and Bear Dance. The music is lively and exciting with an emphasis on fun and participation. Depending on the venue and the number of guests, The Grinnigogs will perform without amplification where possible. For larger gatherings amplification may be necessary and we can provide everything that is required all our equipment is PAT tested and is covered under our 5 million Pound Public Liability Insurance. Hi Kerry – it’s lovely to hear from you – in answer to your question – we charge the following rates for Scotland £250 per musician plus travel and accommodation we can supply a duo, trio, four piece or five piece band. We are based near Hull.